While sales in the trade have weakened generally book fairs have benefited from the widely remarked decline in open shops. Many booksellers feel the need to participate – for the visibility - and for those eligible, the ABAA fairs are considered the best of the American opportunities. This trade group also has exchange privileges with other bookseller groups thus permitting ABAA members to exhibit overseas and overseas booksellers to participate in the ABAA’s three annual events. 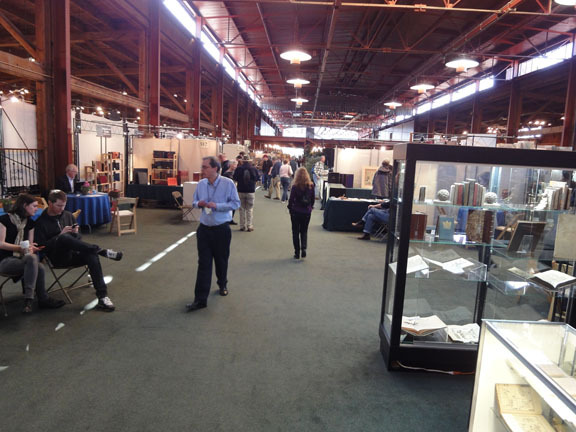 This year sixty-three of the two hundred-thirty exhibitors in San Francisco were from Canada, Europe and Asia. Another exhibitor, in comparing the show to ten years ago said, “We have lower expectations. It’s not the same market. We adjust.” This year’s theme was music but by all reports no dirges were heard. The ABAA also recently reported that it is shifting its LA venue for next year’s fair to Pasadena. The move is expected to lower costs and increase participation.